Lucky Franc's Brand 100% real natural horn handmade shoehorn. Before people stared making cheap plastic and metal shoehorns, shoe horns were made with real bull horn. Our handmade and durable shoe horns are beautiful, feel awesome in your hand and on your foot, look great, and will perform well. Each shoehorn is unique in color due to the natural horn material. Soft browns, golden yellows, rich blacks, and flecks of white and silver are common. No two units will be exactly alike, which adds to the handmade custom feel of each shoehorn. Perfectly sized at approximately 7.25" long and 2" wide these shoehorns are small enough for travel needs and large enough for everyday home use. Protect your shoes: Shoehorns are made to help you slip on your shoes more easily and comfortably. They also help prevent the backs of your shoes from wearing out and breaking down. Good shoes are expensive! A shoe horn will prolong the life of your shoes, make them easily to slip into, and will protect your investment. Unique Gift Idea: Packaged in a classy black gift box that's easy to gift wrap. Makes a great gift for men, co-workers, bosses, Christmas, Father's Day, or any holiday gift. 100% Satisfaction Guaranteed. If you're not happy we'll make it right! Check out our other popular Lucky Franc's Products on Amazon. 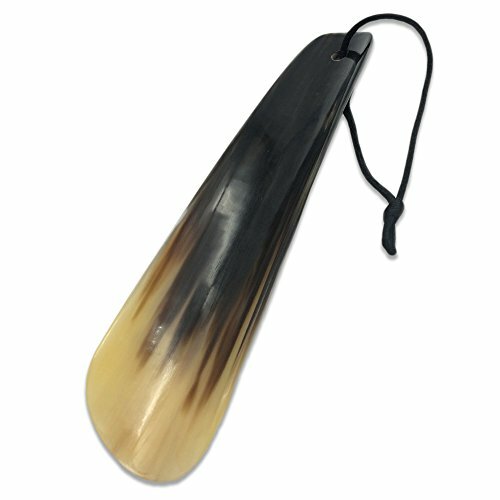 REAL HORN NATURAL SHOE HORN - Made with natural & real bull horn. Approx 7.25" x Long and 2" wide. Great for travel or home. Won't set off metal detectors at the airport like metal shoehorns! Natural Horn. NOT A CHEAP PLASTIC OR METAL SHOEHORN! Handmade Quality for fine men's and women's shoes. GREAT GIFT for men, women, holidays, Christmas, co-workers, birthdays or any occasion. Comes in a classy black box. Manufacturer: Red Cat Brands, Inc. Publisher: Red Cat Brands, Inc. Studio: Red Cat Brands, Inc. If you have any questions about this product by Lucky Franc's, contact us by completing and submitting the form below. If you are looking for a specif part number, please include it with your message.